This weblog entry updates my article, "Maj. Hasan's Islamist Life." It also provides more information on the army's willful blindness vis-à-vis his Islamist furies. Anwar al-Aulaqi in Yemen in 2008. In the months before the shootings, the two discussed how Hasan could make several transactions of less than $10,000, a threshold for reporting to U.S. authorities, the source continued. Hasan did not explicitly vow to fund terrorist activities or evade tax and reporting laws for contributions, the source said. "I believe they were interested in the money for operational-type aspects, and knowing that he had funds and wouldn't be around to use them, they were very eager to get those funds," he said. He insists on wearing a beard for Islamic reasons. He rejects wearing an Army combat uniform which he said "represents an enemy of Islam." He devised something called a "defense of others" to justify his massacre, claiming he acted to protect Taliban from U.S. soldiers. Public statement: Hasan has released a more-than-six-page statement asserting that the U.S. government is at war with Islam. It begins with "In the name of Almighty Allah, the most gracious and the most merciful, my name is Nidal Hasan, Major Nidal Hasan, and I would like to convey a message to the world." "My complicity was on behalf of a government that openly acknowledges that it would hate for the law of Almighty Allah to be the supreme law of the land." ... Hasan then apparently asked if this was a war on Islam. "You bet it is," he said. "I participated in it." ... "I would like to begin by repenting to Almighty Allah and apologize to the (Mujahideen), the believers, and the innocent. I ask for their forgiveness and their prayers. I ask for their forgiveness for participating in the illegal and immoral aggression against Muslims, their religion and their lands." Most of the documents also include the acronym "SoA," which is considered shorthand for "Soldier of Allah." In the only document bearing a date—Oct. 18, 2012 -- Hasan writes: "I, Nidal Malik Hasan, am compelled to renounce any oaths of allegiances that require me to support/defend [any] man made constitution (like the constitution of the United States) over the commandments mandated in Islam ... I therefore formally renounce my oath of office ... this includes my oath of U.S. citizenship." In another document, the only one which is typed, Hasan declares that American democracy and Shariah law are incompatible. "There is an inherent and irreconcilable conflict. ... in an American Democracy 'we the people' govern according to what 'we the people' think is right or wrong; even if it specifically goes against what All-Mighty God commands." 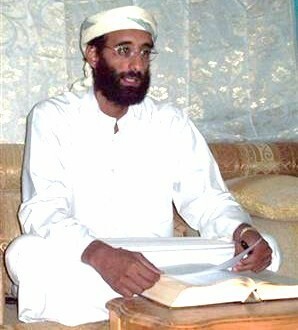 On his relationship with the radical cleric Awlaki, with whom he exchanged emails before the massacre, Hasan also wrote: "He was my teacher, mentor and friend. I hold him in high esteem for trying to educate Muslims about their duties to our creator. May All-Mighty Allah accept his martyrdom." Opening message of the trial: Almost four years after his massacre, Hasan's trial has finally begun. He is serving as his own lawyer and has made Islam central to his message. From the Washington Post account of his address to the panel of 13 military officers who will decide his fate. "Fellow members, good morning," Hasan began at the opening of his court-martial at the Army post here in central Texas. "On November 5, 2009, 13 U.S. soldiers were killed and many more injured. The evidence will clearly show that I am the shooter." ... He said he had been on the wrong side of a war against Islam and had switched over. "We the mujahideen are imperfect Muslims trying to establish the perfect religion in the land of the supreme God." ... He apologized for "any mistakes I've made in this endeavor." He stated that his plan was "to shoot soldiers and not shoot civilians." ... He did not want to shoot civilians as he believed that killing soldiers would be more accepted in the Muslim community as compared to killing civilians...although he had initially considered civilians to be targets as they helped soldiers prepare for deployment. prosecutors were allowed to show Web pages Hasan visited and Internet searches he made in the days and months leading up to the shooting, including searches about killing innocent women and children, fatwas and jihad. Hasan agreed to prosecutors' revised definition of jihad Monday as, "under Islam, the central doctrine that calls upon believers to defend tenets of their religion" with "the heart, the tongue, the hand or the sword." The Army psychiatrist said he "was defending my religion," according to a letter sent to the Killeen Daily Herald and published over the weekend, the latest in a series of documents released to the media that provide insight into his motives. In the letter, Hasan said Islam should prevail over other religions as well as American democracy, and that a foreign policy replacing Muslim holy law, or sharia, with secular government was "not acceptable." "We are imperfect Muslims trying to establish the perfect religion of All-Mighty Allah as supreme on the land," Hasan wrote, referring to Awlaki as "my teacher and mentor and friend" and signing the letter "SoA," an acronym for "Soldier of Allah," or "Servant of Allah." Three days before his massacre of soldiers, Hasan asked his supervisors and Army legal advisers how to handle three cases that disturbed him and after his name in signature, he included a Koranic quote: "All praises and thanks go to Allah, the Cherisher and Sustainer of all the worlds." An FBI expert testified that Hasan conducted jihad-related and Taliban-related Internet searches on his laptop in the days and hours before his attack. was promoted from captain to major in May 2009 and assigned to Fort Hood that July, and his officer evaluation reports referred to him as a star officer. Nonetheless, the officer who assigned Major Hasan to Fort Hood told an Army official there that "you're getting our worst." ... The Senate report found that Army officers who knew of Major Hasan's problematic behavior gave him evaluations that misstated his actual performance and ignored concerns and complaints about his radical Islamic views. was completing a fellowship at Walter Reed National Military Medical Center, ... military supervisors praised his unique interest in Islam's impact on soldiers, according to documents provided to The Times. Maj. Nidal Malik Hasan's supervisors had also repeatedly recommended him for promotion, according to documents. The evaluation reports were filed while Hasan, an American-born Muslim, was earning a master's degree in public health through a two-year fellowship in disaster and preventive psychiatry. A colleague of Hasan's at Walter Reed testified that he pursued the fellowship in order to avoid deployment. 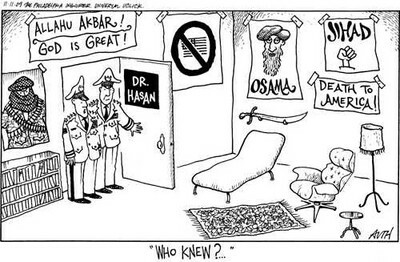 The other report, completed March 13, 2009, said Hasan had "outstanding moral integrity" and that he had selected a "challenging topic" for his master's of public health project: "the impact of beliefs and culture on views regarding military service during the Global War on Terror." Supervisors recommended Hasan for a position "that allows others to learn from his perspectives," noting his "unique insights into the dimensions of Islam" including "moral reasoning" were "of great potential interest and strategic importance to the U.S. Army." Muslim soldiers should have the option of being released as conscientious objectors to reduce the prospect of "adverse events." "I think the Department of Defense should allow Muslim soldiers the option of being released as conscientious objectors to increase the morale of non-Muslim soldiers in the military as well as decrease adverse events." "if you don't submit to God—and this was a story of the children of Israel, when they were, God said, 'Revolting, persisted on working on the Sabbath,' and he turned them into apes and pigs." "I am going to read this out because I personally like it, but it personally depicts a scene in Heaven, according to the Koran. 'And their recompense shall be paradise and silken garments because they were patient. Reclining therein on raised thrones, they will see there neither the excessive heat of the sun nor the excessive bitter cold. And the shade thereof is close upon them, and the bunches of fruit thereof will hang low within their reach, and amongst them will be passed round vessels of silver cups of crystal; crystal-clear made of silver.'" Toward the end of the presentation, an unidentified audience member finally spoke up with a question focusing on what Hasan's statements had to do with mental health care for U.S. soldiers. The exchange shows Hasan not answering but instead trying to draw attention to murderous attacks of another U.S. soldier in 2003 in Kuwait. The audience member said: "I'm a bit confused about what the intention would be other than identifying those who might have conflicts with that and getting them the appropriate spiritual counseling, which is separate from [UI] mental health care." Hasan answered: "I think that might be enough. In the case of Hasan Akbar, the articles that I read, that wasn't even done." Shortly after that comment, Hasan was thanked and received a round of applause. "We always talk about God and country, but here we're talking, we're really talking about God versus country," Hasan said. "There's a lot of soldiers, that once they actually leave the military, they're actually joining or trying to join groups like the Taliban and al Qaeda and so you have to ask yourself..there's something out there with these groups that's really resonating." the video released to Fox News, Hasan is also asked about the number of virgins in paradise, provoking nervous laughter from the audience. "It's there. There's a lot of virgins. It's heaven. You know, It's heaven...that's all I can say." I formally and humbly request to be made a citizen of the Islamic State. ... It would be an honor for any believer to be an obedient citizen soldier to a people and its leader who don't compromise the religion of All-Mighty Allah to get along with the disbelievers. Hasan appears to make multiple references to the Koran in the letter, and includes a bulleted list of guidelines for "believers." In one subsection titled "Jihad," Hasan praises "The willingness to fight for All-Mighty Allah," describing it as a test that elevates the "mujahadeen" who "are encouraged to inspire the believers." He states that "fighters ... have a greater rank in the eyes of Allah than believers who don't fight." Of course! I considered those who were trying to help the U.S. undermine the Taliban's attempt to establish Sharia (God's) Law as the supreme law of the land and replace it with something else like a democracy that doesn't rule by God's law the enemies of God, and thus worthy of fighting/killing. Sudden Jihad or "Inordinate Stress" at Ft. Hood?